"My wife and I love eating Mexican so I came up with this recipe so that we could have a little more variety in our morning meals. We are busy people and don't have time to make elaborate meals in the morning. In the past we have bought frozen breakfast burritos, but they are not very tasty and I knew they could be improved upon. 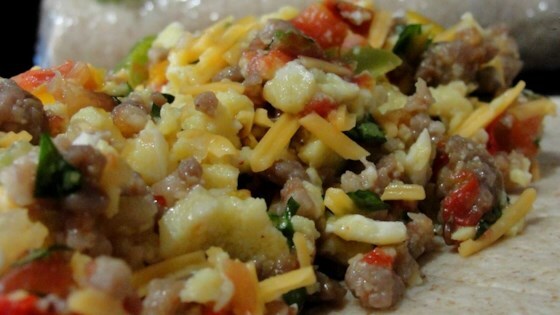 This recipe will make a large batch of the burrito fixins that you can freeze, or store in the refrigerator so that you can make great breakfast burritos whenever you please."